Instead of Turning Himself Into a “Figurehead”, President Sirisena must “LEAD” or be Dubbed Political Charlatan. President Maithripala Sirisena’s days are numbered. That’s by his own admission, publicly announced in the speech he made immediately after being sworn in as the country’s president. He announced that he will not be sworn in a second time. Assistant Secretary of State for South and Central Asia U.S. Department of State, Mrs. Nisha Biswal, called on President Maithripala Sirisena on Feb 2 at the Presidential Secretariat. As such he numbered his own days, one can argue. Given that he campaigned for a limitation of the very same powers he would acquire if elected, he essentially argued for a ‘numbering’ as well as a diminishing. In a post-election context where he did not have a party, Maithripala Sirisena was forced to revert to a 2001 situation with Ranil Wickremesinghe as a calling-all-shots executive (all but in name). A few days later, Sirisena became leader of the party that has the most seats in Parliament. Ironically, while retaining all the powers enjoyed by his predecessor, the President has not only transferred the un-transferable (at least if one subscribes to basic democratic tenets such a representation) but has by choice turned himself into a mere figurehead. This may be the historical role that the President has always wanted to play. It could be read as statesman-like and magnanimous, but it would also amount to cheating 6.2 million voters. However, if Sirisena wants to remain relevant even in a presidency that is ‘checked and balanced’, his current wallflower state of being has to be reviewed and altered. As things stand, the United National Party (UNP) in word (Ranil’s assertions) and act (Ravi Karunanayake’s election-oriented interim budget) is clearly gearing for a General Election sometime in May. The UNP will take on SLFP without a leader (given Sirisena’s wallflower preferences) and saddled with a long charge sheet for the previous regime’s crimes of omission and commission. 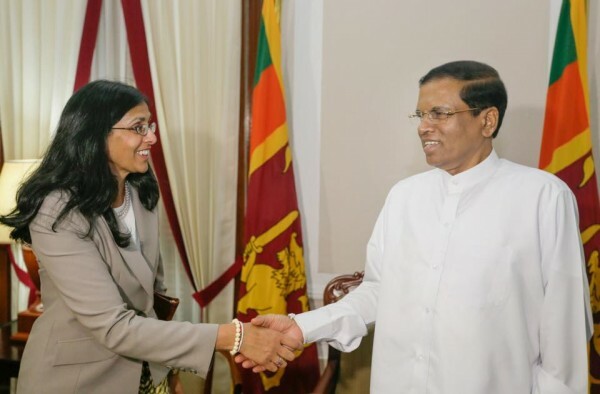 That Sirisena is the leader of the Sri Lanka Freedom Party (SLFP) and the fact that the SLFP has pledged support to the new Government will not absolve the party and more importantly will not taint the UNP. Of course the UNP has its own skeletons, but a weak SLFP will not be able to drag them out. Moreover as the visible architects of positive changes after the election those other negatives of the past will be relatively easy to deal with. President Sirisena, therefore, is looking at an election result that leaves him with a smaller Presidency and given a strange self-effacing fascination a voice that would be even quieter than that of Chandrika Kumaratunga during the Wickremesinghe premiership of 2001-2004. It would be a Presidency besieged by a UNP that might well have a Parliamentary majority. This would be the likely outcome of an election held under the current system or one held subsequent to electoral reforms pledged by President Sirisena in his manifesto. If Sirisena wants to play wimp, that’s his business. It would be the wickedest slap the voters have ever received since Independence and would turn the entire idea of representative democracy into a monumental joke. Again that’s his choice. However, if President Sirisena wants to remain relevant and is the democrat he claimed to be or at least is in the eyes of those who voted for him, there are certain things he has to consider. First of all he has to acknowledge that political marriages are tenuous and those between the two major parties are even more fragile. A parting of ways is scripted into agreements in invisible ink and all signatories are aware of this fact, Maithreepala Sirisena included unless he’s gathered nothing during his quarter century in Parliament. Accordingly, planning for the inevitable rupture is a non-negotiable for all leaders. If a rudder-less SLFP will further diminish a dwarf-by-choice President, senior SLFPs must know that the future looks bleak. They have to move for party reform. If the President wants to be more than say a William Gopallawa and doesn’t want to contest as the person who harmed the SLFP most, he must take charge immediately. He has to understand that it is not in the UNP’s interest to clean up the SLFP. Politically, what serves the UNP best at this point is to let the bad eggs remain in the SLFP. It makes for good slogans in an election, obviously. It would be politically inadvisable to initiate prosecution at this point. This is exactly why the SLFP has to do its own clean-up. There’s enough material against a number of MPs to warrant withdrawal of party membership. In their place, the SLFP has to appoint people with impeccable records, preferably professionals of good reputation. A month is more than enough time to take to task the thugs, drug-dealers, thieves and loud-mouthed. It should have been done a long time ago and not doing it cost Mahinda Rajapaksa. It should be done whether or not an election is to be held. It will not be enough but it is necessary. The SLFP has to have a campaign strategy. It has to have a team to lead the campaign. It has to have a manifesto that is stamped with a recognizable party identity. As things stand, the SLFP is floundering and the UNP’s long-standing handicap of being out of touch with the electorate might not mitigate this fact, especially if Sirisena insists on keeping his distance in the hope that the UNP will make good on the promise of forming a national government for the next two years. The Cabinet Spokesman, let us not forget, has already gone on record to say that what is said during campaigns is largely irrelevant. The people of this country did not elect a wall ornament. President Sirisena has to understand this. They elected a man they believed would lead them. ‘LEAD’: that’s the key word. President Sirisena can lead, he’s proven that. He has to continue to lead. He cannot be wallflower and leader at the same time. Right now he has two options: lead or acquire the tag ‘political charlatan’. His days are not numbered, strictly speaking, but his days as a national leader certainly are.